You’ve got the professional quality Waxaway products; now get some advice from the salon professionals. You will be waxing like a Salon Pro in no time if you follow these tips for waxing preparation, technique and post waxing care. Always make sure your skin is clean, dry and free of oils or moisturisers prior to waxing. Exfoliate 24 hours prior to waxing to remove any dead skin cells. In hot or humid conditions, lightly dust the skin with talcum powder before your treatment, this absorbs excess sweat and moisture to ensure that the wax adheres to the hair you wish to remove. Test the wax temperature by applying a small patch to the inside of your wrist. If the wax doesn’t spread smoothly, it is too cold. If the wax feels too hot, wait a few minutes while your wax cools to avoid burning your skin. For Waxaway Warm Wax, Aquawax Roll on Kit & Salon Pro Strip Wax, always apply thinly, so that the hairs are still visible underneath the wax. Hold the spatula edge on a 45° angle to the skin for the best results. For Waxaway Salon Wax & Salon Pro Hard Wax, always apply in a thick oval shape. Hairs should not be visible underneath the wax for the best result. Always ensure you apply wax in the direction of hair growth and then remove it in the opposite direction of hair growth as close to the skin as possible. When removing wax, always ensure the skin is taut either by tightening your muscles or by holding the skin firmly with one hand. Immediately after removing the wax, apply pressure to the waxed area to help relieve the discomfort. Do not attempt to scrub off sticky wax residue with water. Use Waxaway After Waxing Oil or After Care Lotion to dissolve remaining wax and condition the skin. Only Waxaway Warm Wax and Aquawax Roll on Kit can be removed with water. Use tweezers to remove stray hairs after waxing. 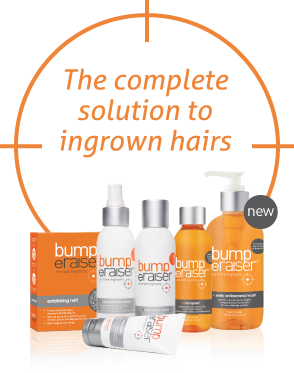 If you suffer from ingrown hairs, irritated skin or pimples, treat the problem with the Bump eRaiser Ingrown Hair Treatment Range. Visit www.bumperaiser.com.au for more information. It is important to always read & follow the instructions that come with your Waxaway product, if you are unsure of anything, remember that our qualified beauty therapists at Waxaway are here to help. Ask your waxing questions by submitting an enquiry through our website or call direct during business hours on Freecall 1800 245 412.